Independence water is safe to drink and citizens may resume normal water usage. 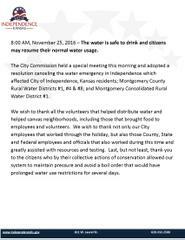 8:00 AM, November 25, 2016 – The water is safe to drink and citizens may resume their normal water usage. The City Commission held a special meeting this morning and adopted a resolution canceling the water emergency in Independence which affected City of Independence, Kansas residents; Montgomery County Rural Water Districts #1, #4 & #8; and Montgomery Consolidated Rural Water District #1. We wish to thank all the volunteers that helped distribute water and helped canvas neighborhoods, including those that brought food to employees and volunteers. We wish to thank not only our City employees that worked through the holiday, but also those County, State and Federal employees and officials that also worked during this time and greatly assisted with resources and testing. Last, but not least, thank you to the citizens who by their collective actions of conservation allowed our system to maintain pressure and avoid a boil order that would have prolonged water use restrictions for several days.